Can NFL Coaches Overuse Play-Action? They Haven’t Yet. The play-action pass is one of the most effective calls in all of football. The three teams that use the play-action the most — the Rams, the Patriots and the Chiefs, according to data from Sports Info Solutions — each locked down a first-round bye in the playoffs. Across the league in 2018, quarterbacks with at least 100 pass attempts average 1.39 yards per attempt more out of play-action than they do on all other plays.1 This pattern of play-action success holds true for every year that we have data.2 Yet despite this success, the league average share of plays that are play-action passes is just barely above 20 percent. Why is play-action so effective? When defenders bite on a play-action fake, they move out of position for defending the pass and create clear lanes for the QB to throw to the intermediate and deep parts of the field. But NFL coaches tend to run them only a handful of times per game because they appear to believe that overuse of play-action will cause linebackers to stop biting on the fake. Diminishing returns will set in, defenders will stop respecting the run, and the superiority of play-action will vanish. But is this actually the case? Do linebackers start to ignore the fake handoff if they see it many times in a single game? Until very recently, we had a hard time answering this question with the data that was available. But in the past couple of weeks, the NFL released a tranche of Next Gen tracking data for 91 games from 2017 via its inaugural Big Data Bowl. Michael Lopez, the NFL’s director of analytics, spearheaded the effort to allow analysts to dig into the tracking data and mine it for insights. I was able to use this data to quantify the effect of play-action on the movement of middle linebackers — and to see if a high number of play-action plays had any effect on the outcome of the plays. Distance traveled by a defender while biting on a play-action fake is a fairly precise way to quantify just how fooled a defender was on a play. Continuing to move toward the line of scrimmage when the offense is passing is a problem; defenders want to “get depth” as soon as they can if they identify pass. Any movement toward the line of scrimmage is usually wasted. After summing up the total distance traveled for each of the plays, I calculated that on the average play-action pass play, the middle linebacker covers 7.5 yards of wasted ground. In seven instances in our sample, teams ran 15 or more play-action plays in a single game. Those games would have offered the middle linebacker the most opportunities to figure out the play-action, but the average distance traveled was 8.2 yards — even higher than the overall average. I broke out the average wasted distance traveled by linebackers by the number of times a play-action pass was called in a game to see how teams reacted. It turns out that the wasted distance traveled was remarkably stable. Linebackers bite just about the same amount the 11th time a play-action pass is called in a game as the first time it’s called. It’s only after we get to 12 play-action passes in one game that things start to get wonky — but that may be because of the small sample sizes of those instances. Across the entire sample of 91 games and 1,235 plays, I found no correlation at all between the number of times a team ran the play-action and total yards of wasted ground by middle linebackers.5 We’d love more data to examine, to look closer at what happens when more play-actions are run. But given what we know about the effectiveness of the play, the self-imposed threshold set by play-callers of roughly six to nine play-action fakes per game is likely too low. Stopping the run is a major focus at every level of football, and the NFL especially makes it a high priority to effectively defend the run. Teams do this by coaching their linebackers and box safeties to play the run first in nonobvious passing situations. This emphasis on run stopping comes at a cost, however. Defenders must read their “run keys” — movements by the offense that indicate a run is coming — and react quickly to fill their gaps and prepare to make a physical play. It could be the case that defenders simply don’t think about how often the team is faking the run but instead just read and react to their run keys. To play fast in the NFL, it’s often said, you can’t think but instead must react based on instinct and training. Perhaps that instinctual reaction explains why play-action continues to be effective no matter how often it’s used. It’s also probably the case that certain teams and players are more susceptible to play-action than others, and smart NFL teams will identify and exploit their opponents’ tendencies. Those smart NFL teams should also pay attention to exactly how they use the play-action. 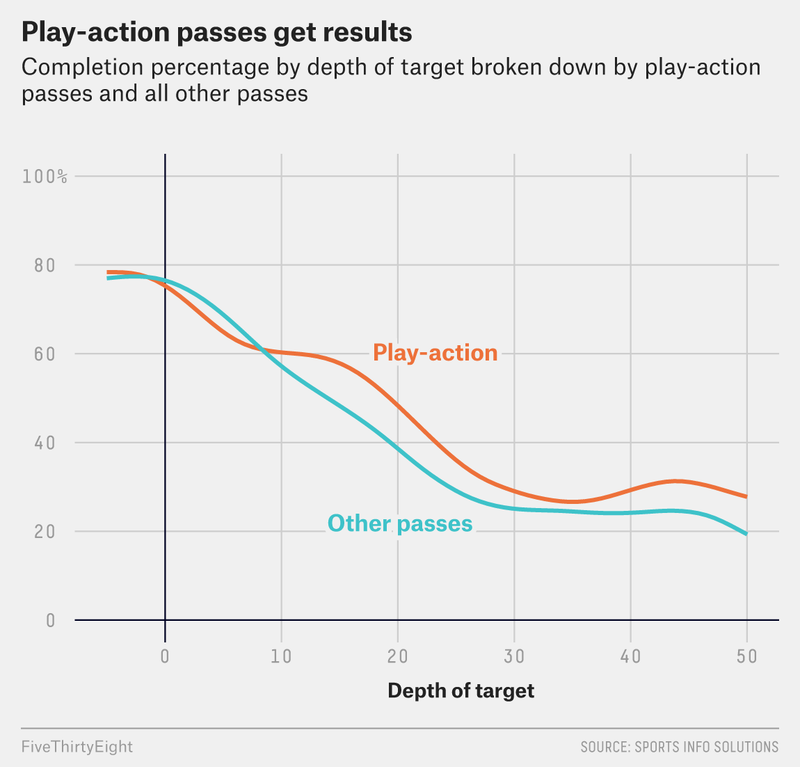 According to the Sports Info Solutions data, passes thrown 7 yards deep or less are caught less frequently on play-action than on other passes. This could be because defenders have moved toward the line of scrimmage and are in better position to make a play on the ball. Play-action is only more effective than other passes when the ball travels at least 8 yards in the air — over the head of the linebackers who’ve been fooled. There is a lot of good research showing that teams don’t run enough play-action. Most of the arguments for limiting its use are unsupported by the evidence. Now, thanks to the NFL’s Next Gen data, we can add evidence that middle linebackers won’t stop biting on the play-action, even if it’s used more than NFL coaches have been comfortable running it.